I've been creating an "Illuminated" version of Project Gutenberg's Dao De Jing A Minimalist Translation by Laotzi (translated by Bruce R. Linnell). It's a commission from Oberlin Editions Press via my friends at Deleon Designs. According to the contract, I'll maintain rights for all but the printed book. At first blush, creating yet another version of the classic seemed pointless. I've seen dozens of illuminations online, albeit most look amateurish and/ or too "New Agey." Not that there's anything wrong with New Age, but these designs can look cliched. 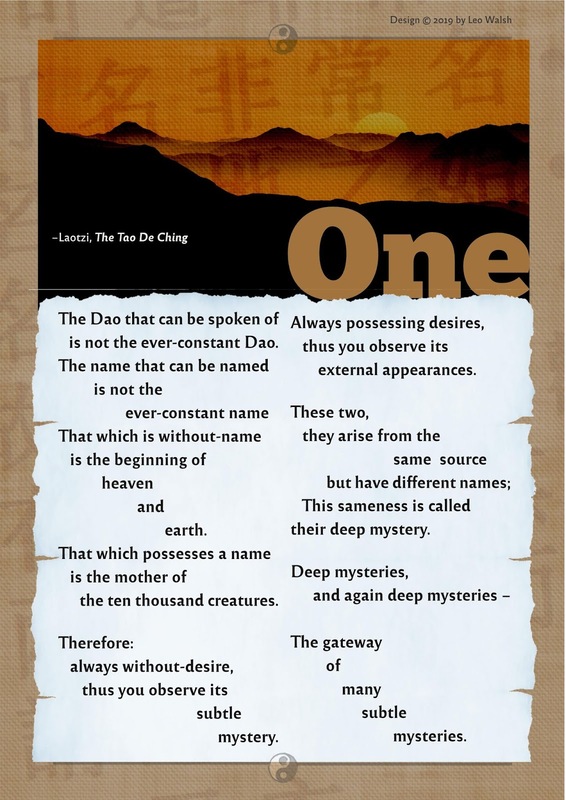 What's more, they often miss the naturalism that infuses Daoism. Or, worse, they'll make a contemporary person meditating and/ or doing yoga the image's focal point. But in retrospect, there is a need for a quality version that combines high-quality graphic design with the quality text. Oh, one last thing. If this book ever sees print (I've got over more pages to produce, and then the folks at Oberlin Editions need to sign off, etc.) it'll probably carry the classic Anglicized spelling Tao Te Ching instead of the translator's preferred, and more accurate, Dao De Jing. 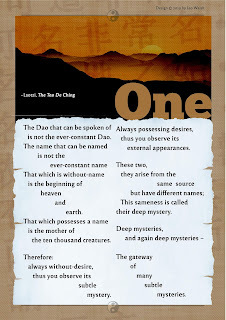 The reason being, of course, that readers are more apt to search "Tao Te Ching" by a mile. And even in Oberlin, that austere enclave of progressive politics, going back to the abolition, suffragette, and anti-war movements... well, they like money, because they like food, clothing etc. Buy my novel, "even snow melts" on Amazon. 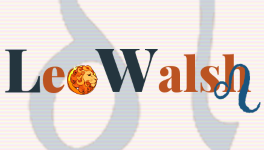 All text copyleft, 2013 by Leo Walsh -- covered under the creative commons "Share and share alike.". Simple theme. Powered by Blogger.